Unless you are an avid bread baker, you may never have heard of a Danish bread dough whisk. However, you may want to investigate this handy kitchen utensil, since experienced bakers often swear by this essential tool. What Exactly Is a Danish Bread Dough Whisk? This whisk is not the traditional type you may be picturing. Rather, it has two stiff metal loops mounted at the end of a sturdy wooden handle. It is designed to mix dough prior to kneading. The metal loops slice through a dough mixture, rather than lagging in it, and are effective without over-mixing dough; it also avoids introducing air into the mixture as a traditional whisk or beaters can. Can't I Just Use a Spoon? Of course you can. However, the surface area of spoons and spatulas often sticks and drags through thick dough. Sturdier than many flat whisks, it also offers the advantage of an extruded shape for greater mixing leverage. 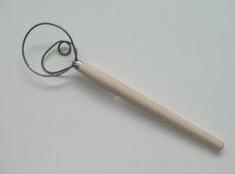 The Danish bread dough whisk is more effective at moving through delicate batters or heavy dough mixtures. It can also be used for pancakes, muffins, brownies, cookies and other thick batters. It can also be used to "cut" in ingredients when making bread. In addition, it is very easy to clean. If you are an avid baker, this is a utensil that may prove valuable for your kitchen endeavors! While these Danish whisks aren't sold on every street corner, they are increasing in popularity. Sold by specialty kitchen stores and gourmet supply houses, they range in sizes and price, but are quite reasonable. Look for one with a comfortable, ergonomic handle. Most will need to be hand washed to keep them in best condition. While your average cook may not stock one of these, dedicated bakers may want to have this whisk as part of their standard equipment.